Ting Ting and Kenneth met in Hong Kong and relocated to Australia as young adults. Within a short space of time they not only mastered the English language, they earned university degrees, established admirable careers and adopted two fluffy white pooches. Though they’ll return to their homeland for a big wedding next year, they wanted their legal marriage ceremony to be a low-key affair, conducted in their adopted country. Within minutes of my first conversation with Ting Ting, I was drawn to her bright personality and her sentimental nature. Though she had indicated that she and Kenneth wanted a simple “Legals Only” style of ceremony, I sensed that they might enjoy making a little more out of the occasion. And so I suggested that they dress up, ditch their backyard for a beautiful, wide open space and hire a professional photographer for an hour. They loved the idea! Ting Ting & Kenneth eloped at Zonzo Estate, a stunning wedding venue, vineyard and restaurant in the Yarra Valley. Their parents flew over from Hong Kong to witness the happy event and to keep a close eye on pooches Christmas and Pinkie, Joanne from Lily Infusion Weddings acted as our official interpreter and the incomparable Rick Liston captured it all on camera. run away secretly in order to get married. 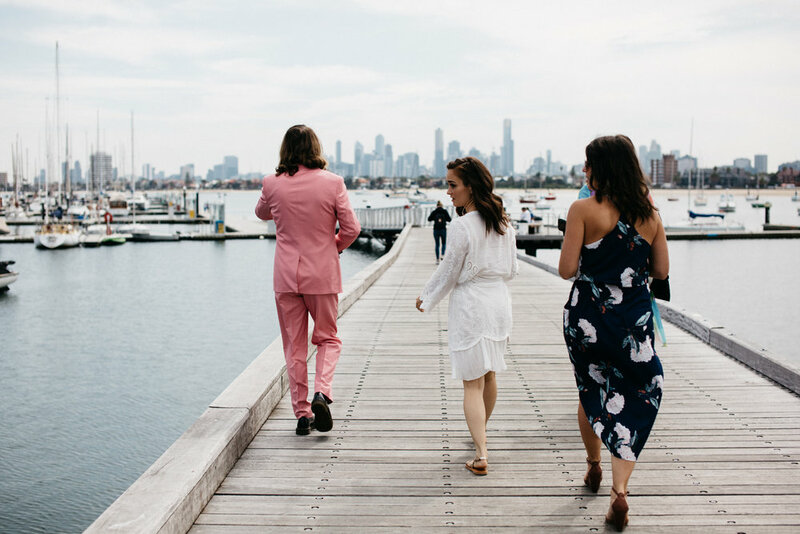 Christina and Warren were married before four friends on St Kilda Pier in what was one of the happiest and most heartfelt ceremonies I've conducted. While most of the world was busy going about their working day, time seemed to stand still for Christina and Warren. They looked into one another's eyes and reflected on the decisions that had led them to each other. They spoke of their love and admiration for each other and of their gratitude for the relationship they had cultivated. They laughed, they cried, they grinned as their friends gave impromptu speeches and then, we all drank spicy margaritas! I have long admired Nat’s work as a stylist. On countless occasions I’ve seen her transform ceremony venues into jaw-droppingly beautiful spaces. When I met her many years ago, I was equally as impressed by her warmth and humility. When Nat and Pete asked me if I would conduct their elopement ceremony, I felt so very honoured. Nat and Pete were married on a warm Autumn afternoon on a rooftop terrace in Sandringham. Nat entered the rooftop with her mother to Evermore's I'll Never Let You Go wearing a sheer lace gown she designed and made herself. She even assembled her own bouquet of white O'Hara roses. She's seriously clever! With the brightest of blue skies above them, Nat and Pete stood before their parents, grandparents and siblings to celebrate a relationship that began on the slopes of Mount Baw Baw some fifteen years prior. Nat and Pete’s ceremony unfolded in such a relaxed way. Their small gathering of guests (including their good friends John from Warrenphotography and Marcus from C2 Films) involved themselves throughout - laughing, crying and commenting without reservation. Their love for Nat and Pete, their unrestrained displays of emotion and the strong sense of celebration is something I shall always remember. "My thoughts go out to you my immortal beloved, I can live only wholly with you or not at all. Be calm my life, my all. Only by calm consideration of our existence can we achieve our purpose to live together. Oh continue to love me, never misjudge the most faithful heart of your beloved. Congratulations Nat and Pete and thank you for inviting me to share in the beauty and excitement of your intimate celebration. I sincerely loved every moment spent with Team Jordan! 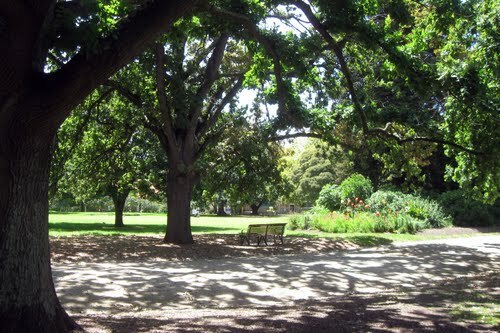 Melbourne is blessed with so many beautiful parks, gardens, beaches and reserves. From time to time I'm asked by couples for recommendations. That's easy! Here are some of my favourite public places. National Gallery of Victoria and Peter Rowland Catering. If you plan to hold your ceremony in a public place, be sure to check with local council or Parks Victoria to confirm whether a permit is required and the conditions of the permit. Conditions may relate to site and insurance fees, bond payment, hire duration, maximum group size and whether structures such as marquees and market umbrellas can be erected.